Now that blogs exist, I hardly ever buy magazines anymore as there’s so much to read online, but when I did, I noticed something they did a lot was these ‘steal, spend or splurge?’ articles where they picked a product and found very similar options to suit different budgets. Anyone else remember those (is it a British thing)? I was usually most interested in the ‘steals’, but particularly if something looked like occasionwear – I’m quite careful about weighing up cost-per-use. So when I came across this Collectif hat, I knew I was never going to buy it. As lovely as it is, £25 (not including the shipping) could buy me e.g. a top that I’d wear regularly. But I really, really loved it… I scoured vintage shops online to find something similar, but everything I saw was even more expensive and not the cute shape this one had that I’d fallen for. So I gave eBay a try, and I’m so glad I did! I found one that was virtually identical, came in numerous colours (I was after ivory, which Collectif do make but is hard to get hold of) and when you’d added in shipping, worked out to be £12.50 cheaper. So I’ve done my very own ‘steal or splurge?’! As I mentioned, I wanted an ivory hat to go with a wedding guest outfit and the eBay seller didn’t let me down. It arrived in under a week (somehow, from China) and was under the £15 cut-off for China -> UK customs charges, so I didn’t get stung by extra taxes (always do your research when shopping like this!). I’m surprised by the quality and am so pleased with it generally I wanted to share it here, as it’s such a good alternative. Of course, as with many of these things, I don’t know the ethics around how the cheaper hat was made, but saying this, I actually don’t know much about Collectif’s either (however, I’ve got a feeling their goods aren’t locally manufactured as they’d probably mention it if so). I’m a bad, bargain driven shopper… It’s worth mentioning that if you’re similar to me in this respect, eBay is a great place for finding felt pillbox hats of any shape, size and colour for great prices. So cute! I'm nearly always a "steal" person. Unless a hat is ridiculously unique and I'll wear it often… I can't spend THAT much on it. I'm more into 30s-40s styles, so those are more expensive than the more readily available 50s and 60s hats. I want to get into 20s looks, and another blogger recommended looking for 60s does 20s types of hats for a cheaper option. I'm going to look for one! Yep me too – bargains are so much more attractive to me than putting down loads of money on something. Where's the challenge in that?! I think the 80s does 50s, 60s does 20s etc etc is a very good option for stuff like this – good point! Thanks Cici, I'll definitely remember to check Ebay for one of these when I've got some cash. Happy to help! Like I say, there's lots of them on there, it's just this one was the best bargain and my favourite. This is such a good idea for a blog series! 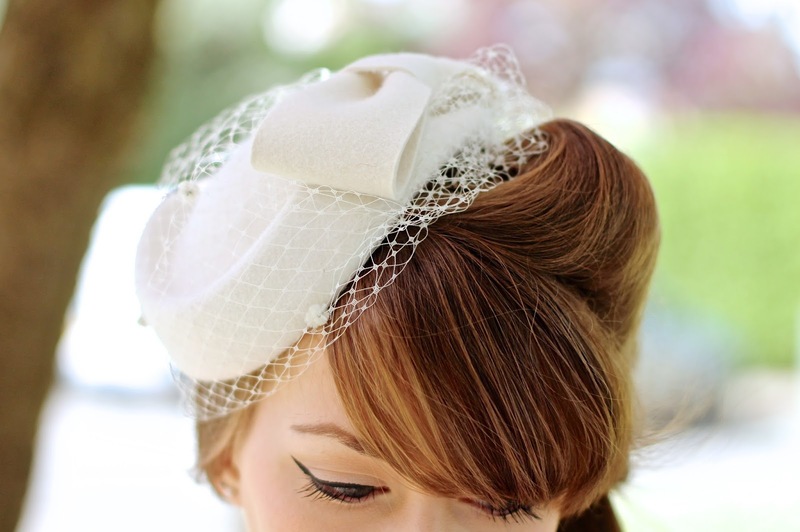 Love the hat, I got a collectif one in the sale but haven't had a chance to wear it yet, I need to get better with money! I was great before I started blogging! Definitely love steals! I'd have to realy fall in love with a certain item and it's details in order to buy it at more expensive prive points. I should consider price per wear more like you do though…. I was also wondering how you get that type of hat to stay in your hair. Do you pin it a certain way? I feel exactly the same! Ah in this case, the hat itself has two little comb grips on the inside lining, so I used those tucked onto some backcombed hair for a firm grip. It also has an elasticated ban presumably for wearing under your chin, but as it's black there was no way I was using that! Fantastic post! You are a smart comparison shopping, deal hunting, hat loving lady after my own heart. From shoes to skirts to undergarments, I've found similar deals on eBay (and less commonly, elsewhere online) that were either vintage or modern versions of high street or department store offerings. In fact, one area in particular where I've had a lot of success with this is craft supplies. Way to shop and save, dear gal! I'd never thought of eBay for craft supplies – I do very little crafting, but occasionally I've had the need to buy replacement buttons etc so I really must remember that tip! Ha, me too! Glad you agree it's adorable, I'm looking forward to showing it off in an outfit soon. It really did make said outfit! I really like the ebay option better! It looks very elegant. Well done with the comparison, im more of a one click pre setting sort of girl and just buy what I like. I really need to shop around a bit more. You've inspired me to challenge myself. hello there,ciao…cannot wait to see the wedding guest outfit option B…I guess it's a chic work of Art! It is always good to see these comparisons and I think I prefer your steal to the splurge! It looks great in the final photo so look forward to seeing the whole outfit!